Scenic land on the North Saskatchewan River. Half hour to North Battleford, under an hour to Saskatoon. Only 6 miles from four (4) lane HWY 16. If you are dreaming of building on the river, this is a beautiful quiet spot with 126 acres of private playground and a view of the mighty North Saskatchewan River. Directions: 2 and half miles west of Ruddell, Sk on grid road then 2 miles south. Or 3&1/2 miles south of HWY16 at Hammond Realty sign. 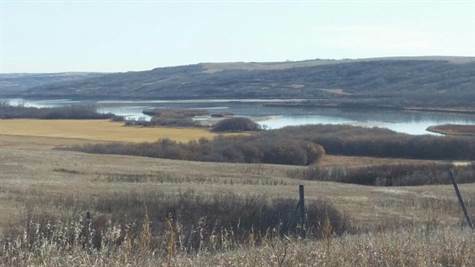 Land is on North Saskatchewan River with grid road access off of HWY 16 approx 25 minutes east of North Battleford or 50 minutes west of Saskatoon. It has half mile of river front.